Home » »Unlabelled » Do You Know What Happens if You Eat Just One Silica Packet! Do You Know What Happens if You Eat Just One Silica Packet! Have you ever wondered what happens if you eat those silica packets marked “Do Not Eat”? If you are among those who have thought about it, read on and you will not have the need any more to experiment on your own. Even though you have never wondered, now you can find out so you know and can share this potentially interesting, potentially useless trivia with someone who would appreciate it. The packets typically consist of silica gel, and this is known as a desiccant, or a substance that absorbs the water vapor in its surroundings. The pockets are found in all sorts of products to aid in maintaining quality. This is for the reason that during shipping, products can get wet. The silica gel can become saturated and reused by heating it at 300 degrees Fahrenheit. This makes it a useful substance and it is likewise nearly harmless. This is why it is usually in food products. There are various types of pellets within those packets. Some of them are clear while others are translucent white and bigger to absorb liquid. The others are translucent and used in the production of silica gel cat litter. These go through an additional drying process. 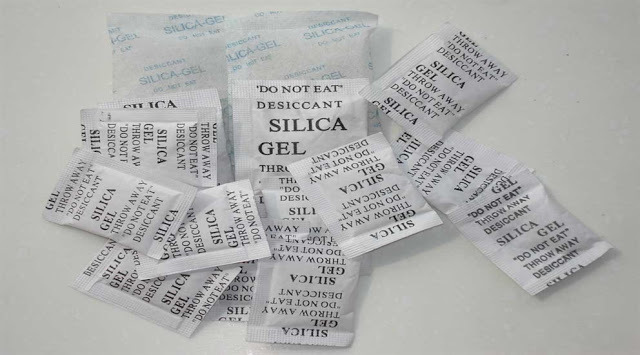 In 1918 the use of Silica Gel was patented in order to keep products from retaining moisture and being ruined. However, silica gel was around in the 1640’s, when it was considered a curiosity for those who were interested in science. Amid World War I, it became beneficial as it was utilized in gas mask canisters to absorb vapors and gases. If you eat silica packet, it would bring about some uncomfortable conditions in your body. While not life-threatening, the silica would take all the moisture out of your mouth. You would have dry eyes, a dry and irritated throat, an upset stomach and dry mucous membranes and a dry nasal cavity, just in case you swallowed it. However, in order to put you in danger by sucking all of the moisture out of your body, 10 pounds of silica are needed to absorb 4 pounds of water. We know that 70% of a human body is made up of water that means a 201-pound man would have to take 367.5 pounds of silica to withdraw all moisture from his body. It is highly doubtful that anyone would consume that much silica ever. Since the packets of silica weigh 0.1 ounces, so that means a 210-pound man would have to consume 58,800 packets of silica gel. Now when you are informed what Silica Gel is, how it works and how unlikely it would be to cause harm to yourself by taking one that does not mean to run out and start eating every gel packet you find. They can be beneficial for many things. Just keep in mind what they are there, for every time you discover one.